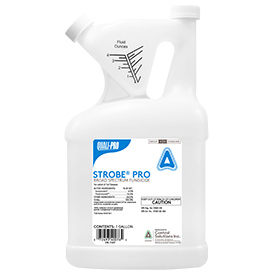 Strobe® Pro is a combination of two broad spectrum, preventative and curative fungicides, Azoxystrobin and Propiconazole, with systemic properties for the control of many important turfgrass diseases. Strobe® Pro may be applied as a foliar spray in alternating spray programs or in tank mixes with other registered, turfgrass protection products. Strobe® Pro is compatible with many commonly used fungicides, liquid fertilizers, herbicides, insecticides and biological control products. Application sites include lawns and landscape areas, golf courses, around residential, institutional, public, commercial and industrial buildings, parks, recreational areas and athletic fields.